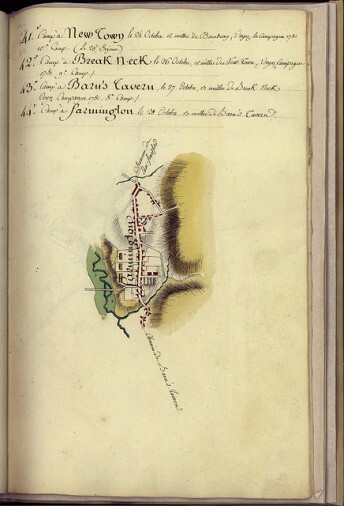 This map, “Camp à Farmington le 28 Octobre, 13 milles de Barn’s Tavern,” is a page from the manuscript atlas Amérique Campagne 1782. The volume, one in a series, once belonged to Jean-Baptiste-Donatien de Vimeur, comte de Rochambeau, the commander of the French army in America during the Revolutionary War. France formalized its aid to the colonies following the treaties of 1778, sending military and naval forces to assist the insurgents against Great Britain. Lieutenant General Comte de Rochambeau arrived in Newport, Rhode Island, on July 11, 1780, with 450 officers and 5,300 men and led them to victory at Yorktown, Virginia, 15 months later. The manuscript outlines the plans of the camps for Comte de Rochambeau’s army during their return march north from Williamsburg, Virginia, to Boston after their victory. The pen-and-ink and water-colored maps provided basic topographic information, including a simple representation of the layout of the terrain and roads as well as the location of the closest water supply. The soldiers marched in four divisions about a day’s march apart. Moving such a large number of troops required careful planning and the camps shown on the maps were often occupied for four or more nights. “Rochambeau Digital Map Collection.” University of Connecticut Libraries, Map and Geographic Information Center (MAGIC), 2012. Link. “The Rochambeau Map Collection.” Library of Congress, American Memory, 2012. Link. “The Washington-Rochambeau Revolutionary Route.” National Park Service, 2011. Link.